We visited Sandy Hook, NJ as a daytrip from eastern PA. It was a comfortable drive without any major city hassles. Once you go over the bridge, there are several beaches to choose from on both ocean and harbor sides. There is a fort at the end of the island with a lighthouse, as well. Wonderful beach. We combed the beach nearer to the end of the island, just before the Fort. I believe it was Beach K.
We only hunted for 20 minutes due to being rained out and I came away with some beautiful pieces. There were a couple thick light sea-foam green pieces and even one orange piece! There are lots of clam shells littering the beach and pieces of debris, so you have to look thoroughly, but if you keep your focus, you will definitely come away with some treasures. A word of advice, there is alot of newely broken glass that litters the beach, so shoes are a must or you might get a nasty cut. 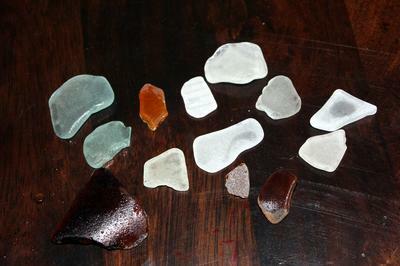 I just picked these pieces up and threw them into the surf to be tumbled and hopefully collected later. The included photo does not show any jewelry-grade sea glass, so officially, from the photo, the rating would be "Poor." 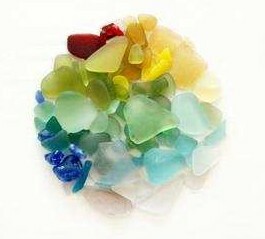 However, as Amanda states, there is likely a lot of craft-grade sea glass for your sea glass projects. Three important factors you must know to really get started on finding the best sea glass beach near you. Sandy Hook, New Jersey, USA, I have been going there for 20 years 2 to 3 times a week. I have never found any sea glass, and just a few shells. 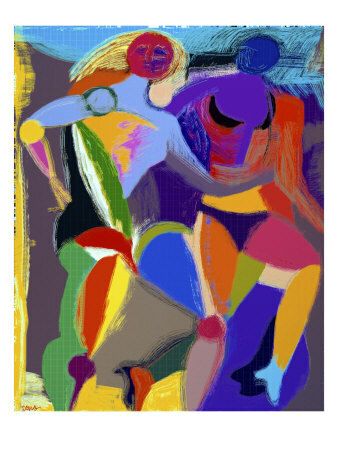 Just thought I'd let anyone thinking of going to Sandy Hook, NJ know that one of the beaches is a nudist beach. It's located beyond the Coast Guard booth where you pay for parking, on the ocean side (east side). My husband and I love the nudist beach (so liberating), but in the many times we've been there we've never found any sea glass.